Using DBHawk user can create Tables, View, Sequences etc. A user can alter Columns, Tables. Add new indexes to the tables, add or create Primary Key, Foreign Key, Unique Key, Check constraints. 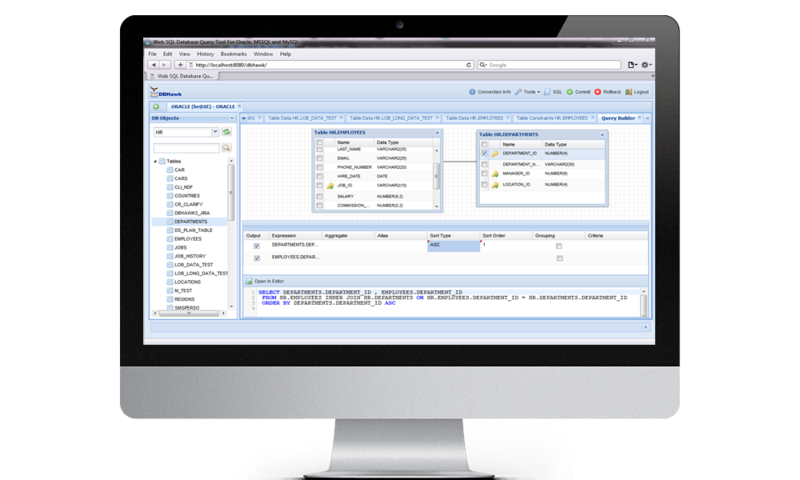 Online SQL Query ToolUsing DBHawk, DBAs can manage databases, Manage Users, Security, Sessions, Storage Etc. Using DBHawk advanced SQL Query Editor user can execute multiple queries and view results in separate tabs. A user can format queries, Cancel Long running queries, View Query History, Create Database Reports in PDF or Excel format, Export results into various formats, Save SQL Queries or upload queries. A user can also apply various functions on result sets to do further analysis. DBHawk provides an advanced capability to manage table data. A user can create a new row, delete a row, duplicate row or edit existing row.